East-west wall of the Church of the Redeemer, south view. © Vriezen 1994, 50 Plate II.21, edited by Dieter Vieweger. 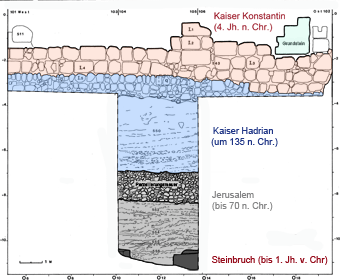 The structure mistakenly called the "Second Wall" proved in its lowest layers (fieldstones) to be part of Hadrian’s structure to the south of the sanctuary built in 135 AD. It was raised further over the following two centuries to become a terrace wall (worked stones) and probably served as retaining wall for the forum created at the beginning of the 4th century AD to the south of Constantine’s Church of the Holy Sepulchre. The area north of the east-west wall was heaped up gradually during the 2nd and 3rd centuries AD. In the process, the wall made of fieldstones with the perpendicular smaller walls (the foundations of otherwise undecipherable Hadrianic buildings) gradually became a raised terrace wall. Worked stones were used for this purpose. When finally at the beginning of the 4th century AD Hadrian’s temple was demolished and the Church of the Holy Sepulchre was built, the east-west wall at its present height that today runs along the nave of the church probably served as the retaining wall of the forum built to the south of the Holy Sepulchre. The associated stone flagged ground is about on the same level as the ancient cardo to the east of the Holy Sepulchre, i.e. at +752.60m MSL. Because of its interpretation as a city wall, the terrace wall mistakenly identified as the "Second Wall" was described in the secondary literature as wider than it actually is: instead of the actual width of 1.60m, it "grew" in the work of H. Vincent and A.M. Steve to an impressive 3m. Only towards the south did the wall have a fairly "flat" surface. To the north it had cavities and gaps and was not intended to be seen. To the east, beyond today's visitor bridge, one can see one of possibly two vertical seams in the brickwork. From this point the wall swung on its eastern side by 6° to the north.